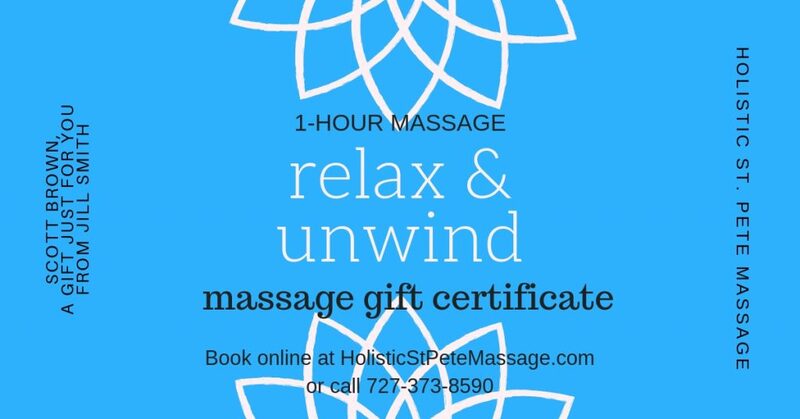 Give the gift of peace and relaxation with a St. Pete Massage massage gift certificate from Holistic St. Pete Massage! Treat a friend or loved one with a massage so they can relax and unwind. A St. Pete massage gift card is a great gift because everyone enjoys the experience of letting go of stress and taking care of themselves. Regular massage therapy can help reduce stress, improve blood flow and improve movement, flexibility, and posture, and can help manage and address longstanding issues with muscle tightness, restricted movement, tension, and pain. Best of all, it just feels good to relax! You can easily purchase my St. Pete massage gift cards online via Paypal (which accepts major credit cards). I can prepare the massage gift certificate and email it to your gift recipient, or I can mail the gift card via old-fashioned postal mail–it is your choice. Massage gift cards are valid for one year from date of purchase, and the massage appointments can be conveniently scheduled using my online booking system. Ready to purchase a massage gift card? Simply select the massage gift card you would like from the drop-down menu below (massages are sold in a duration of 60 or 90 minutes), and click the Buy Now button. If you want to buy a package gift-pack of 3 massages, they are discounted by 10%. The transaction will be completed securely on Paypal, then you will receive instructions to send the gift recipient’s contact information so we can delivery the gift card. The gift card can be sent instantly via email or you can select a specific date for delivery. Feel free to contact me directly with any questions. Just call or text 727-373-8590. Thanks for purchasing the gift of massage! One of the kindest, most intuitive massage therapists you will find. He has a natural gift and will help you feel better whether you need to just relax or get a deep tissue massage. Amazing. Jonathan is the best! I’ve never had a better massage or met a more intuitive healer. His room is a place of true zen and total comfort. A massage from Jonathan is my treat to myself every month! Jonathan gives one of the best massages I’ve ever gotten. It is a perfect combo of deep tissue and relaxation. You will not find a better massage therapist! Jonathan Prue has been my massage therapist for the last 12 years. After a body massage from Jonathan, I am pain free for 3 days! I drove an hour each way to get a session with him each month. He tailors his therapy to address my current needs and could identify the point of origin of my pain, work on it, and give me relief from my chronic pain. I have been a regular monthly client of Jonathan's for over 10 years, before his move from Oregon to Florida. Like myself, I am sure that many of his clients were sad to lose him to sunny Florida. I am not sure that I will find another massage therapist as skilled, with such intuition. Highest recommendation! I highly recommend Jonathan's massage. I always appreciate his unique combination of deep work that also allows me to drift off and take a break from my busy life. Whether you are seeking deep tissue work or desire a deeply relaxing massage you can't go wrong. Jonathan is one of those rare therapists that is able to blend his clinical experience with intuition to provide deeply therapeutic treatment while you drift off and rest. You will feel amazing for days afterwards! I have had many massages over the years and not one LMT has left me feeling the way I felt during and after my massage with Jonathan- relaxed, refreshed, renewed, ready to take on the day, balanced, and just all around more in tune with my body. I am amazed by his work, his energy, and the entire ambiance of the place. It truly was a Spiritual Experience!